You are currently browsing the tag archive for the ‘hungry horses’ tag. 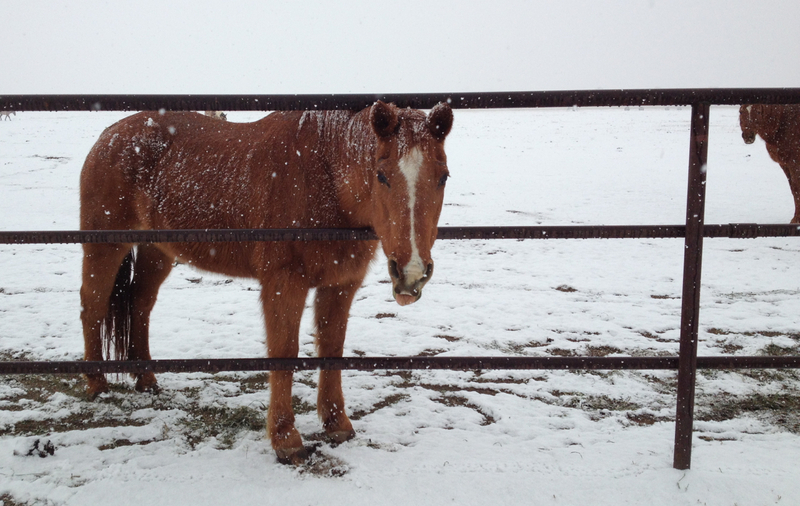 Here’s a pasture equation for you: Snow + Hungry + Bored = Curious Horses. When we returned to Colorado after nearly two weeks in sunny Mexico, (more about that coming soon) we found snowy pastures and bored horses. Horses graze. It’s what they do all day long. A nibble here, a nibble there and before you know it, an entire day has passed. So obviously when there is nothing to nibble on, a horse gets bored. And hungry. 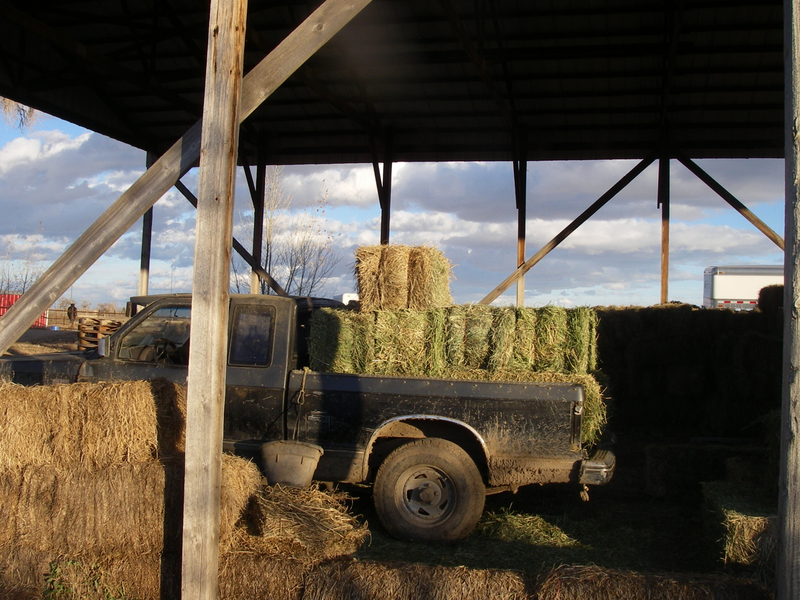 Those twice daily hay deliveries don’t last long. What’s a horse to do with the other eleven hours of the day? Well they grow curious, vigilant really, and always on the lookout for the F-word. I needed to give you this backstory to set the stage for the photos to come. You see, we had to drive into the pasture to get to the Golden Girls, who spent our vacation in their own special “hotel.” They had room service and no one bothered them. 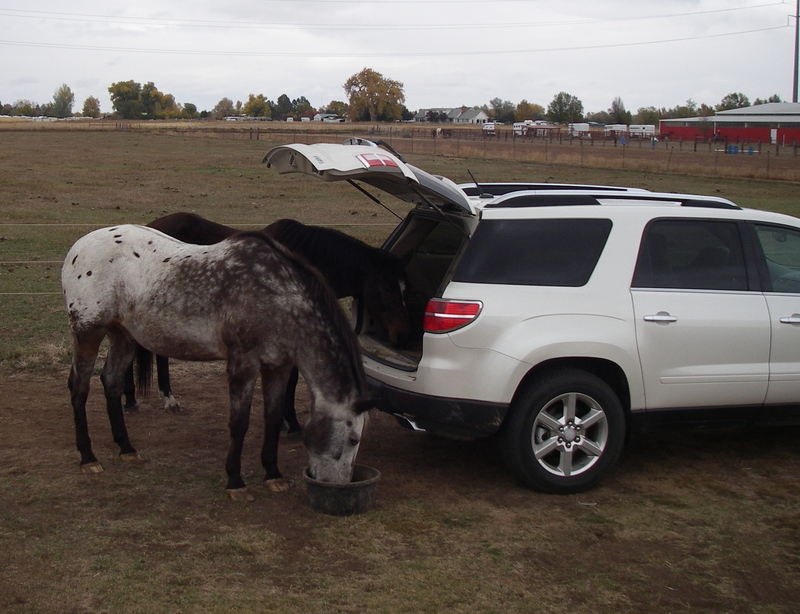 They could munch hay as long as they wanted with no fear of a bigger, stronger horse muscling in. We took them grain before turning them into the bigger pasture. Then we waited. The Golden Girls are dawdlers. At least the one named Pepper! And while we waited we had visitors. Uh..what you got in there? 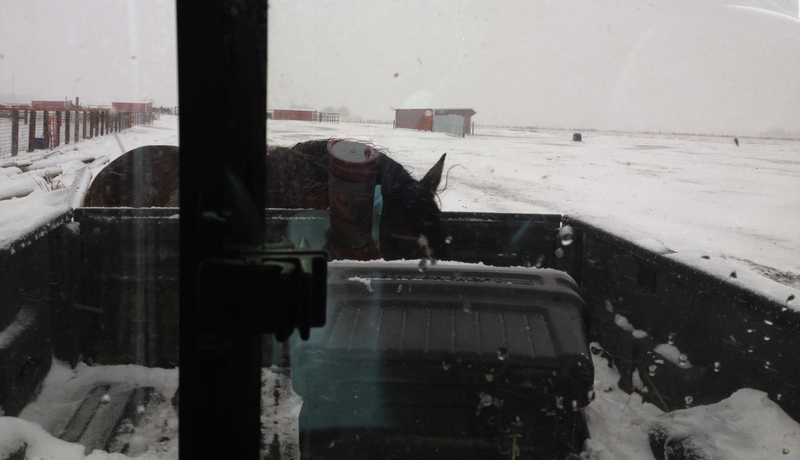 Somebody was certain there was something to eat in the back of the pickup. It is the same kind of vehicle that delivers hay. Right?? Hello big goy? Got anything for me in there? Annie thought it looked pretty warm inside the cab. She wasn’t above begging! Hey give me a hand. There must be something good in here. If one curious horse is good, two are even better! ‘Scuse me. Could you pass the Doritos? Or maybe one of those hay cubes? Please,Please, Please..
March seems to be coming in like a Lion, which I guess bodes well for April. It was a snowy day yesterday when we went out to feed Miss P.
While Pepper ate her grain, Chickadee held watch at the fence, ever vigilant for hay cubes. Knowing us, she didn’t have a long wait. And that’s Minnie off to the right of the photo, eager for her treats. 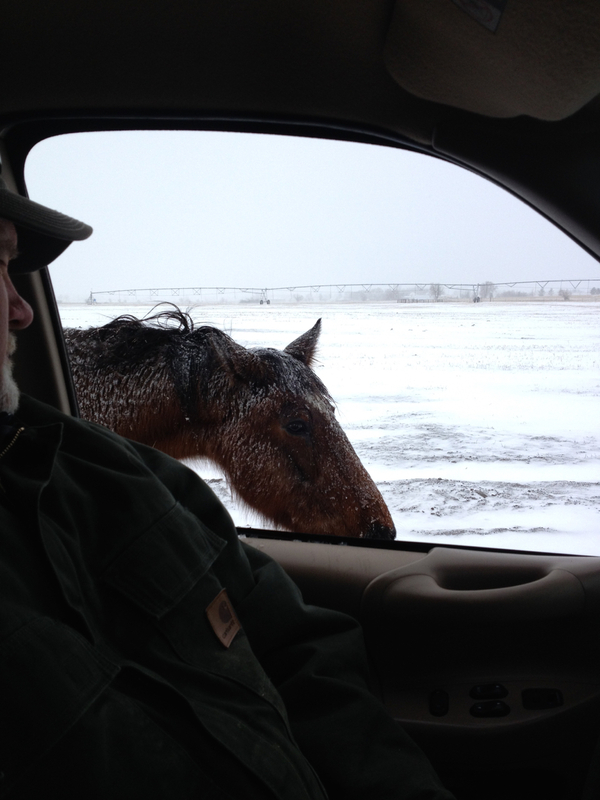 Here in Colorado, February and March are rough months for the pasture horses. It’s when we must keep an extra sharp eye on Pepper because this is when she tends to lose her weight. The herd is bored and hungry. Horses by nature are grazing animals. Their idea of a good time is a field full of grass where they can nibble as long as they want. Which is all the time – a little bite here, a nibble there. And there is enough grass for everyone to eat their fill. 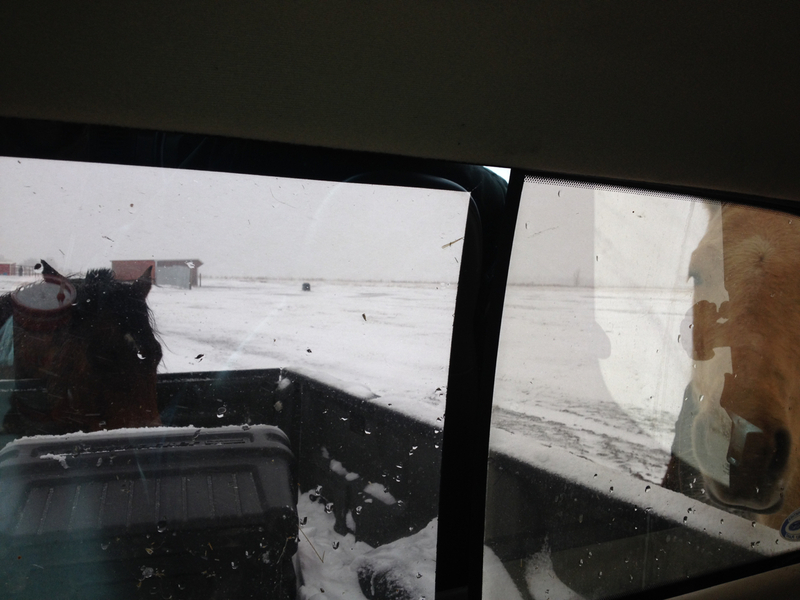 So now the pasture is blanketed in snow, covering even the few bits of dry grass that some horses try to eat. 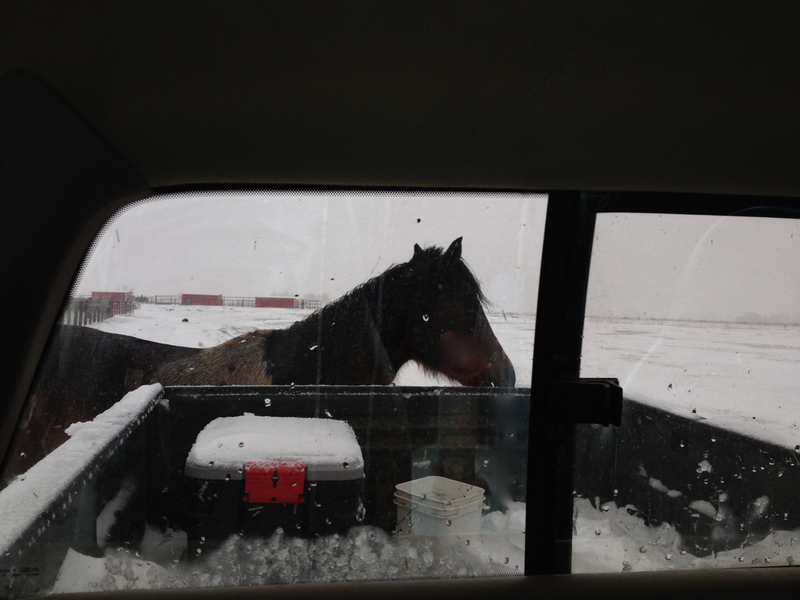 In winter, horses live for the sound of the truck that magically appears twice a day to deposit their ration of hay. They play a game rather like the children’s game of musical chairs. Everyone starts out in a line across the pasture, each with their own small pile of hay. Then the stronger, bigger horses eat their fill and move on to the next pile, displacing the horse that was there. Who then does the same. And the next and the next all the way down the line. And usually at the very end of the line are the Oldsters, including our sweet Miss P. They get nudged away from their hay by everyone. It’s one of the reasons we are so methodical about her daily grain feeding. The rest of the day, the horses mill around nibbling up the last bits of hay, hanging out like boys on a street corner, just looking to stir up a little action. They’ll chase each other, nip and kick, pick fights or stand idly waiting for the sound of the truck and the next meal. The horses jostle each other at the gate for the prime spot. 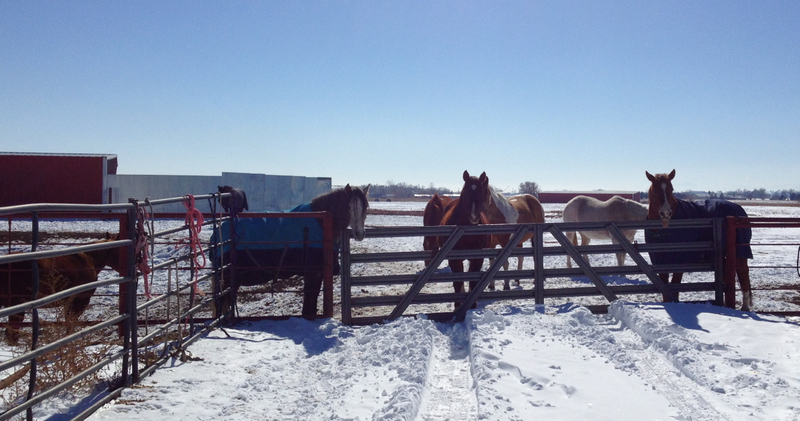 And just as in the hay line, the bigger, more aggressive horses will try to nudge the others away from the gate. But in our little corner of the universe, we don’t allow that behavior. The pushy horses are “strongly invited” to leave. Amigo always gets the first hay cube. There is something to be said for being a good friend. I know everyone is bored and hungry. 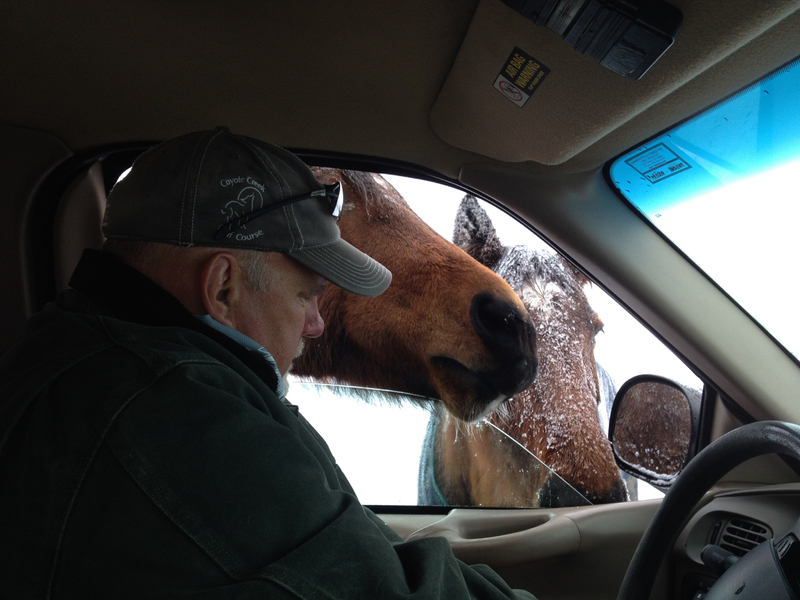 Believe me, I’m doing my part to entertain them with snacks, but we sure are ready for spring and a little green grass. When I’m cold, I think about food. Maybe it’s my body’s way of ensuring that I won’t freeze/starve in the cold. It must happen with horses too. They need extra calories to stay warm. 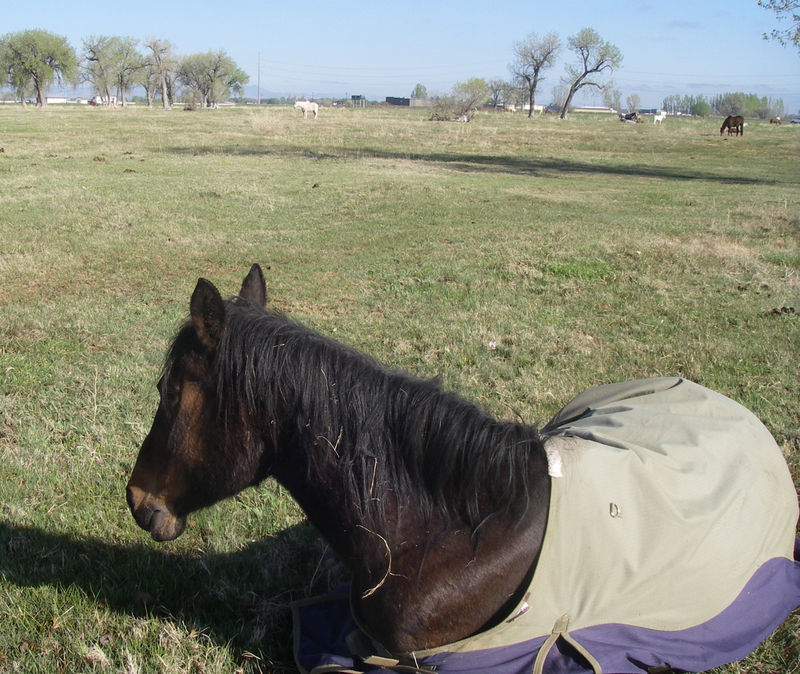 Last week when I was feeding our two old sweeties, I watched three horses in a nearby paddock. 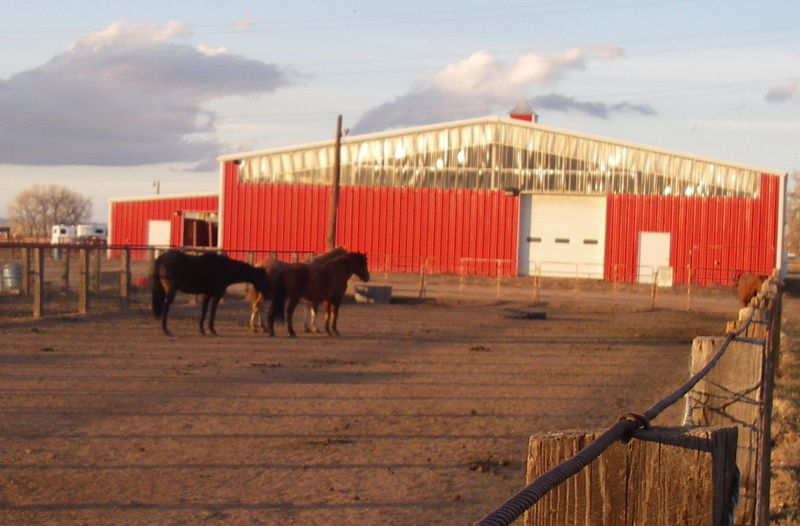 These are barn horses that get turned out during the day for fresh air and more room to run and kick and play horse games. But by late afternoon, they were so finished with all of that. Horse games aren’t much fun when your stomach is growling. Their focus had turned to something else. What was the object of their rapt attention? And darned if it wasn’t still parked instead of delivering hay. Now these horses know the schedule exactly. It was getting late, and they hadn’t yet been led back to their stalls. They were ready for dinner. So they tried the, “if you stare at it long enough, it will move,” approach. I finished with Bud and Pepper, packed the car and drove toward the gate. They turned their backs on her when she finally opened the gate – just to let her know they were not happy campers. But one by one, she led them to their stalls and a big pile of life-giving hay. It’s been a rough six weeks in the pasture. 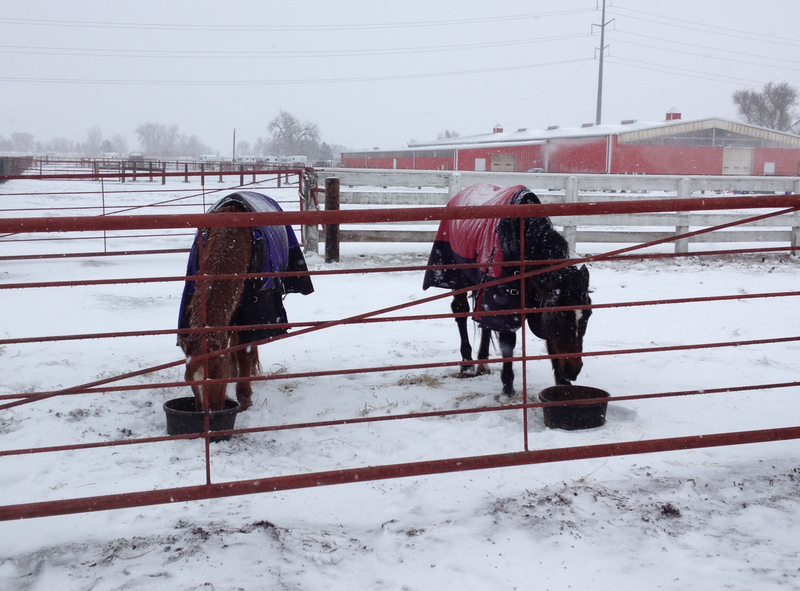 Winter has been hard on the horses and they’ve responded with increased “survival of the fittest” behavior. The winter pasture is grazed to nothing. There’s not an ounce of nutrition in the stubs of brown grass that remained. When we’d come out to feed our two old sweeties, we couldn’t help but notice the desperation in the eyes of the others who dropped by to see if we’d give them a bite or two. Hunger had turned them into beggars. They’d kick and snort at each other and pull out their most aggressive looks. “This is our bread line and you’d better get away from here,” the oldsters seemed to say. We learned that the boarding facility had stopped the evening hay feeding about a month earlier. That explained Bud’s unusual drop in weight, and the ribby look of so many of the horses in the larger herd. Pepper was showing up with kick marks, which I presume happened as she tried to get her share of hay. The mood in the pasture was bleak. Tension rose off the backs of the horses like steam. It didn’t help that the days were grey and overcast. That changed last Tuesday when the horses were let into new pasture. They had fresh green grass to eat, and room to divide into their smaller herd families. The tension evaporated, as did the worried looks on so many beautiful faces. Pepper having a snooze in the sun. The difference in mood was palpable. When you don’t have enough, it changes your behavior. How do you react to scarcity? Do you become more aggressive? Do you hoard your resources? Do you become desperate and mean spirited? Do you reach out and share with others who have even less than you? I’m not talking about the obvious, anatomical differences. What I mean is something much more subtle. It’s about following rules versus ignoring them. 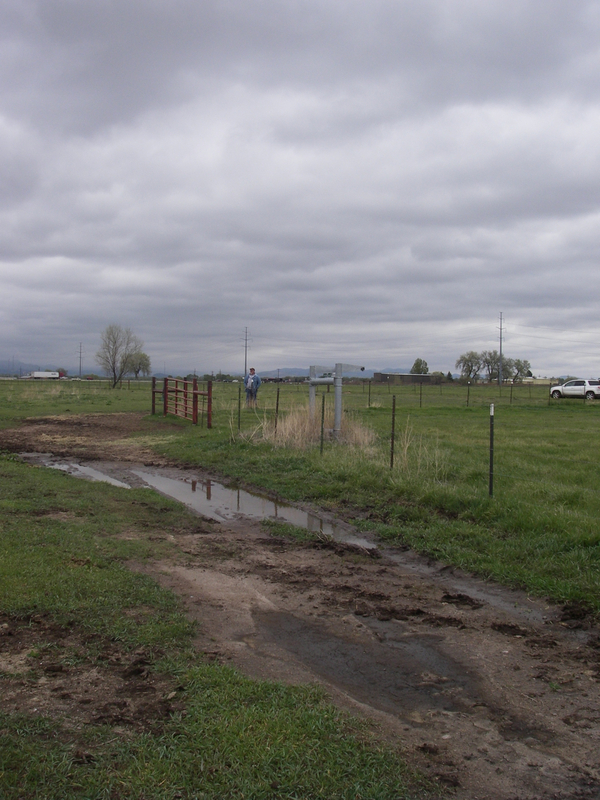 But here’s how it went down in my little world of horses and the pasture. I recognized the look in his eye. It helps to have raised a son and been a teacher for many years. It seems to me that males of all ages (and species) are familiar with that look. And yes, I am aware that this isn’t one hundred percent a gender thing. Sometimes the tables get reversed. Perhaps a bit of background is in order. Our feeding schedule has changed. The green grass of the pasture is just too alluring. Bud and Pepper are less interested in their grain and more interested in nibbling tender green blades of grass. The pasture they’re in is chewed to stubs, so when they get the chance to eat long, fresh grass, well I understand the draw. We’ve worked out a compromise. They eat part of their grain and then I let them wander off to eat grass for fifteen or twenty minutes. Then I bring them back to finish their medicine-dosed grain. It’s working pretty well. Except for one hardheaded appaloosa. He’s decided he needs to sneak off to eat grass before eating even a taste of his grain. He comes out the gate; breezes past the feed pan and shoots me the look. It’s a kind of sidelong glance, laced with attitude. And more than a little guilt. He has this “catch me if you can” thing going. He nibbles grass and watches me out of the corner of his eye. I say things to him like, “I see you,” but he ignores me. 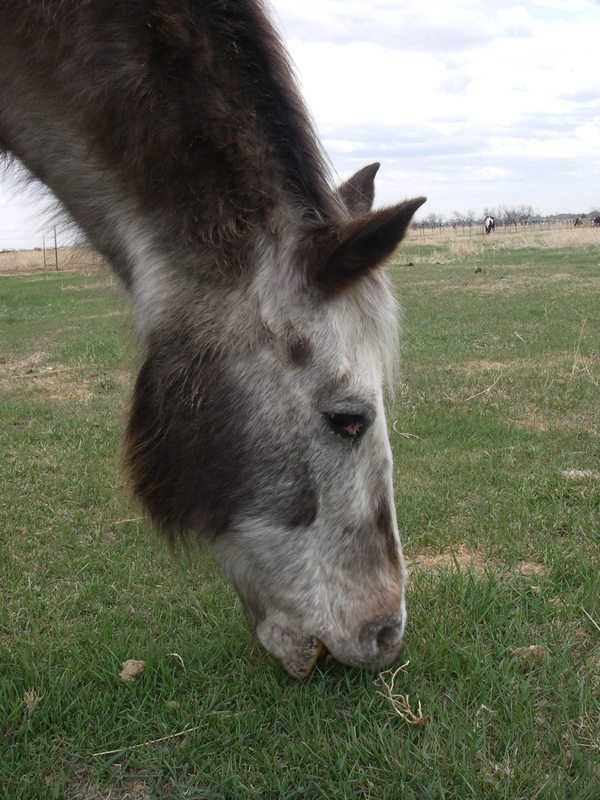 Pepper on the other hand, usually eats at least two-thirds of her grain before heading for the green grass. And she sends no sidelong glances. She knows she’s followed the rules. Just as Bud knows he’s broken them. When it’s time to come back to the grain, Bud has taken to running away. I sigh, stop and regroup. Chasing a horse never works. They just run faster. With Bud we have to get out in front of him. Then he lets himself get caught and we walk back to the grain, which he duly finishes. As soon as she sees me coming, she walks toward me. I don’t even need the halter because she’s figured out the routine. How about you? Follow rules or ignore them? While I was out of town for a few days, my husband took over feeding our two old sweeties. He often accompanies me to the pasture, but lately he’s been at work and the job has fallen largely to me. Bud, Pepper and I have created quite a routine. Our own little routine that Rick doesn’t always totally follow. When I heard the news from day one of the feeding, it wasn’t so good. Rick was running late and worn out from a long, hard day. The horses weren’t kind to him. When I talked to him that evening and he reported on what had happened, I felt like a parent hearing a bad report from the babysitter. It seems Bud and Pepper decided to have a bit of a walkabout after eating their grain. This is really unusual for them. For over a year, they have followed our routine to the letter. Eat grain, have dessert and then go back into the pasture. Many times we don’t even have to direct them. They go on their own. We haven’t even haltered them for months. The little nibs of still green grass in the new pasture must have called to them. Whispered sweet nothings in their pointy ears. What could a self-respecting horse do except follow the siren song? Truth is, the horses are hungry. They are between seasons so to speak. They are still on the pasture – not yet being supplemented with hay. And their pasture is done. Between the heat, the grasshoppers and now the changing of seasons, the grass is worn down to nothing. So I understand. Really I do. It’s just that Rick wasn’t any too happy to be chasing down horses in the evening, with darkness bearing down. Horses who weren’t too interested in being caught. He said Pepper especially was eating like a madwoman. Er… mad mare, I guess. Ripping grass as fast as she could get it into her mouth. I couldn’t have done anything had I been there. It’s just that being away, I felt somehow responsible. Isn’t that crazy? Rick has been around horses longer than I have and is infinitely more capable as a handler. I still felt responsible. Like I’d let him and them down. What is this thing we women have about being superwoman? Doing it all. I can bring home the bacon and fry it up in the pan cuz I’m a woman – w-o-m-a-n. I’ll say it again. Check the lyrics if you’re too young to recognize the song. It didn’t do much for women and our natural superwoman leanings. Most women I know feel responsible for way more than is really within their (our) sphere of influence. Chime in if you know what I’m talkin’ about. P.S. For those of you who keep track, I’m sorry about missing yesterday’s post. I was just getting back from my trip and the time simply got away from me. I had a couple of posts prepared ahead of time (rather like stocking the fridge before I left town), but not one for Wednesday. Given the topic of this post, maybe it was okay to let one go.